Quality of Life Coalition, Inc., received the Blue Cross and Blue Shield of Kansas Pathways to a Healthy Kansas grant in August 2017. Pathways to a Healthy Kansas is the largest community grant program ever funded by Blue Cross and Blue Shield of Kansas. The Pathways program provides community coalitions with the tools and resources needed to remove barriers and engage their communities in ways that enable healthy eating and tobacco-free, active living to become a way of life. The grant funding for each community includes a coordination grant of $100,000, with the opportunity to apply for non-competitive implementation and achievements grants amounting to $400,000, for a total of $500,000 per community by the end of the three-year grant. Also, elementary schools in Dickinson County have free access to GoNoodle Plus for the duration of the funding period. GoNoodle is a website with interactive games and videos that get children moving throughout the day. The activities are designed to help children channel their physical and emotional energy for good, improving behavior, focus and achievement. The Pathways to a Healthy Kansas grant is designed to help Dickinson County make changes across seven focus areas, all converging to collectively make living healthy an easy, familiar, and expected part of routines and traditions. The focus areas are: Community Policy, Resident/Community Well-Being, Food Retail, Health Care, Restaurants, Schools, and Worksites. Increasing youth involvement in Tobacco Cessation programs such as RESIST and Taking Down Tobacco. Coordinating Tobacco Control efforts with medical providers who serve prenatal mothers to increase referrals to cessation services. Developing and implementing Tobacco-Free policies at parks and schools. Planning to develop Creative Placemaking projects which increase opportunities for physical activity as well as cultural enhancement for the entire community. Happy Bear is an evidence-based personal safety program that is offered to children in early elementary schools in Dickinson County. 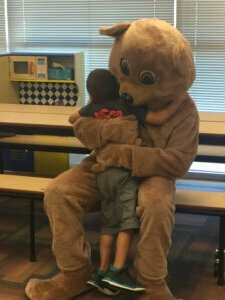 The play features Happy Bear, a lovable bear, who teaches children about sexual abuse. The play teaches children how to say no, walk away, and tell someone if anyone tries to sexually assault them through the “3 R’s” of sexual abuse prevention: recognize, resist, and report sexual abuse. Welcome and Unwelcome Touch (Good Touch/Bad Touch) activity books go to all students participating to reinforce the concepts. Graciously funded through a Community Foundation for Dickinson County grant. Our focus areas on are underage drinking, underage marijuana, and the shared risk factors of suicide.